The polygon-pushing power of the Super FX chip might seem humble in modern terms, but back in the early '90s it was a seriously potent piece of kit and allowed the SNES to produce games like Star Fox, Stunt Race FX and Super Mario World 2: Yoshi's Island. Nintendo liked the idea of souping up their hardware - there was even talk of putting it inside the USA version of the SNES, which hadn't been released at that point - but in the end it had to go into the cartridge to keep the initial cost of the console low. It'd have been awesome if it was as standard on every SNES, so it's a shame that didn't happen. 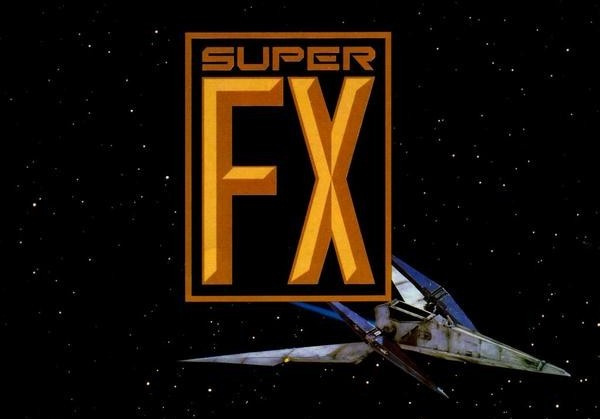 You can read more about the fascinating development of the Super FX chip — and the making of the most famous game to utilise the technology — over at Eurogamer. That's a shame as only a few games ever got to use the chip. Interesting tidbit, I had no clue of that. However the disadvantage would be that we would then all be stuck with FX version 1 and not be able to get the upgraded versions found on games after "Starofx". I did not know that, that is some wacky stuff. Wow, I never knew that. If FX was built in to the system the SNES would have been unstoppable. I can just imagine what types of games would have emerged as a result. Yeah, I think it would have worked out cheaper and better for everyone in the long run if it had been standard on the console but seeing as they missed the opportunity to add it into the original Japanese units I can understand the decision to put it in the individual cartridges instead. Either way, the Super FX chip was awesome. Well Yes but still, No. Wait a sec, did cartridges with the chip cost more at retail? hmm...if the FX chip was ready that early, why were there so few games utilizing it (and all of them from Nintendo)? And why was it released well into the console's life? ...It may have been "talked about" putting it into the SNES, but I don't quite believe it was very close to reality. --Also, the FX chip games were damn expensive! ...as for Virtua Racing: It was really only good for arcade. The home console editions were a poor imitation. About as bad as Killer Instinct for the SNES. Even the 32X version wasn't as good. Nevertheless, for 1992, Virtua Racing was totally jaw-dropping amazing! I think they possibly did but not really by much if anything. Wow. You learn something new every day. Thanks! @micronean because the cost per cartridge would've been too high. Had to let the price of the chip cool off till it was viable to put in games. the Super FX chip just allowed for some gimmicky 3D rotating gears and stuff in Yoshi's Island, right? I don't really see how it would have really benefited games other than entirely 3D games like Star Fox. Nintendo probably made the right choice. The original chip was pretty crude and you couldn't make too many games with that little texture memory and resolution to work with. @micronean Perhaps it took awhile because making 3D games was much more esoteric back then. Most developers had no idea how and off-the-shelf 3D model building software was very new and crude. It take time to get all that going. @MadAussieBloke - Not based on sales figures and who is making games for Nintendo systems now? All pun aside; the console doesn't mean much. Sure, when I was 8 years old and didn't understand the catch phrases companies used and how they were used "blast processing" (LOL). I bought into "my <insert console name> is better then your console". In all reality the hardware doesn't mean much when it comes to a great game and nor does the advertising money that pushes the industry to endorse a really crappy game. I like games that I like and I still like Sonic 1, 2, 3, N&C & Sonic CD plus Super Mario World, Zelda: ALTTP, Metroid and it has nothing to do with what system they are on. Its like these "PS3 is better then XBOX ONE" stuff you see. Maybe one system has more power then another, but that isn't going to decide which games are good or which games are not good. If you act like a child and play the "my console is better then yours" then you're only limiting yourself to a certain console meaning you're probably going to miss out on a game that you really would like to have in your collection. @MadAussieBloke You know what, even as a closet Sega fan I have to disagree with you there. Virtua Racing on the MD was a technical marvel, but it just didn't do it for me. Probably because the game itself is designed as an arcade coin guzzler, and not a sublime home experience like Star Fox. On a side note, I recall reading at the time that the SVP chip apparently caused issues with some cordless phones, making them ring when the game was being played! @micronean NA SNES was launched in August 1991, Star Fox came out in June 1993. When you consider that the chip would have been in development WAY before the game was started, that's not actually such a long period of time. I imagine cost was the main issue, but also timing - it probably would have been too late in the production cycle of the NA SNES to consider dropping the chip in. Great article! I had no clue. Sad how you think Nintendo is the most decent game company out there and then you read stories like that were they steal or re-use ideas without giving credit were it's due. Come on Nintendo, pull up your socks. It would seem more expensive to have to put the chip in every cartridge instead of just in the system. Granted that cost was for the developer but it wasn't like the games were that much more expensive. So how much more would it have cost to just put in in the SNES? Sega would have been dead in the water if the FX was built into every SNES. As great as that would have been, I can honestly say the rivalry between Sega and Nintendo was a healthy one and both systems had some awesome games released. Too bad Sega's answer to the FX chip was only used in one Genesis game (virtua racing). It's comparable to Starfox graphically. At least Nintendo didn't pull a Sega by releasing the FX chip as an add-on like the failed Sega 32x. Ya, its true. I have a copy during then. Love the game. I can still remember that there is another combat flight game also employed this FX chip.